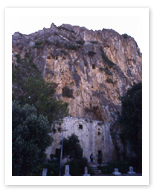 Built into the side of a cliff just outside of the town of Antakya, it is said that Luke the Evangelist regularly gave sermons to a captivated audience in this chapel, while both Barnabus and Paul both came here on their first mission. Mass is still celebrated on Sundays in this small haven of Christianity, which is also the destination for a significant number of people seeking to discover Turkey’s truly rich religious history. St. Peter’s Grotto is especially important on Dec. 29th, when every year worshipers come to pay their respects here on the day of St. Peter’s death.